We DO have a SPECIAL OFFER! Check this out: If you still don’t have FEATURED listings on FindSalesRep.com now is the time! Featured listings are city, state, region or NationWide listings that help get you and your business found and give you access to our Bonus Leads when available. Those go right to your email and they NEVER get posted to Facebook or twitter. So, there a big deal. What is the SPECIAL OFFER? We’d love to feature you and your Direct Sales business on FindSalesRep.com with a Featured Citywide Listing. Normally this premium listing costs $59.98 but for the next 12 hours we’re “giving it away” for only $9.99 (that’s an 83% savings!). To “GET LISTED” and take advantage of this offer go to wwww.FindSalesRep.com/featured and use coupon code CITY999 at check out. Let’s Get You Found!. Blimey! This is going to be Exciting! Can’t wait to Weigh anchor and hoist the mizzen! -Translation: “Pull up the anchor and the sail and let’s get going! We’ve sailed the seven seas and found ye the sleekest schooner you’ve ever sighted. Batten down the hatches CREW and prepare. We are bout to shock ye to the very boney! Arrrrgh! THERE BE TREASURE Matey! It’s a thing of beauty or a some like to call it, A Thing of Booty! A Treasure Chest is where any self-respecting pirate places his BOOTY. Without a Treasure Chest, a Pirate is just another poor sailor tossed about by the SEA. For now, the FindsalesRep Treasure Chest is in the captain’s quarter, under lock and key. BUT… soon, we’ll be burring it and leaving it for all our FRIENDS to find! We”ll Give You The MAP! FindSalesRep.com is unique! We help reps from ALL the MLM, Direct Sales and Network Marketing Companies Get Found, Get Leads and Grow Their Businesses. In the past year, we have helped thousands of Reps from Hundreds of Companies increase their Personal Business Sales and Word is Getting Out! Thanks Lisa! We love hearing Success stories Like YOURS!!! We also LOVE rewarding POSITIVE NETWORKING! and we are going to Give-Away some HUGE PRIZES! Here are the rules: Just tell about your SUCCESS on facebook at http://www.Facebook.com/FindSalesRep ! Have you gotten a lead from FRS? Did someone join your team? Did you make a surprising sale, friend or connection? TELL US ALL ABOUT IT on fb! You can share as many testimonials as you like. Each will count as an entry. Three ‘Supper- Dupper, Greatest Ever’ Rep will be picked randomly from ALL the entries and will WIN an Annual STATEWIDE Listing on http://www.FindSalesrep.com worth $299.88. Don’t worry if you already have one! You can pick up a nearby New State, Gift it to a TEAM Mate or double up on your own exposer!!! Bonus: Everyone who enters a ‘Supper-Dupper, Greatest-Ever’ Testimonial WILL get something! This is So Cool! 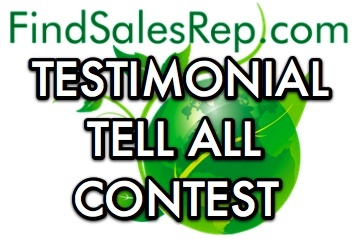 We are going to use Some the Best of these testimonials on http://www.FindSalesRep.com. They are going to be FEATURED on our Sales Pages! AND… that means MORE exposer for YOU! Just one more way we are Helping You Get Found, Get Leads and Grow Your Business! Where are you on the energy scale? Here’s a technique that I’ve used with executive speakers over the years and it works wonders. Right before the presentation I ask the speaker, “On a scale of one to ten—one being asleep and ten being Tony Robbins who is yelling, fist-pumping and smacking his hands against his chest—where are you right this second on the energy scale?” The typical response is somewhere between four and six. I then suggest that the speaker clap his or her hands together three or four times, shake out their arms, and put a big smile on their face. “Now where you are?” I ask. “About seven or eight,” the speaker normally responds. “Now rock it!” I exclaim. Great tip and we know that there are more than a few exceptional leaders right here on FSR too! So, we asked a few to step up and share a few tips of there own! MarilynInfo StopShop wrote: I focus on the help I will be offering, how much it has imporved myself, family and others too. So I get motivated and pumped on helping others excitement. Kim Newsom wrote: I talk to my team members often and every time we get a contact or book a party or have a great lead we call one another and those calls inspire each of us to do better so the next time we can be the one calling with great news!! HOW DO YOU GET YOURSELF AND OR YOUR TEAM MEMBERS GOING? Leave your Tips in comments. Attitude and belief may be the biggest obstacles in your business. There are many different ways of describing the phenomenon. You can call it The SECRET, the Law of Attraction, blind faith, ignorance on fire or Simple Luck, but the fact remands that nearly ALL of us has experienced the benefits of this kind of wishful thinking. So, what’s your story? How has your attitude and or beliefs helped you in your business? Heather Nickless I try to keep a ‘can do’ attitude. I try to keep all negativity out of my thinking. I work better towards my goals when I believe I can do it so I try to always believe I can. It has definitely helped make my business sucessful including having people with the ‘can do’ attitude on my team. Natalie Karen Boecker Who said, “Whether you think you can or you think you can’t, you are right.” ?? So, why not think you can? I believe in always focusing on the positive, in all areas of my life. It sure brings better results, and keeps everyone happier! Thanks Heather and Natalie! The common theme in both of your Success Stories is the idea that “you can do it”. Believing in yourself, being able to see your success will bring you closer to ALL your goals than any training or seminar. It’s amazing how every successful person can tell you a story of how they came from nothing and just knew in their heart they would make it. That strong belief and positive attitude can ride any storm in your business. It can keep you focused, help you get past distractions and through downfalls. Last Sunday we were sitting at church. There was a visiting preacher. In the bulletin, I could see that his sermon was titled, “Finders Celebrate, Losers Complain”. Of coarse when I saw the word “Finders”, being FindSalesRep.com I clued in, sat up straight and paid close attention. There where many stories about great people who went out to ‘find’ the meek, the broken, the worthy, the deserving, those that maybe didn’t ‘have it all together’ but had a good attitude and were willing to try to believe. 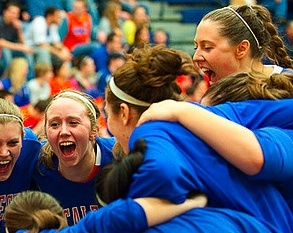 The preacher told us to look for the the celebrators! “Get them in your life and in your business!” Funny, how that message echoed in my Business life, I thought. My husband and I have had great success in Direct Sales. We are successful not only because we know how to generate leads but because we always look for CELEBRATORS! We bring them in to our lives and in to our business. Having Celebrators around is Good For You and GOOD FOR BUSINESS! There’s NO Complaining and Anything is Possible! So my advice: Look for the Celebrators! Look for the ones who always have a new idea, a compliment and an encouraging message! How do you grow your team? There are many ways to boost your business success but all include finding people that are interested in your opportunity and or products. It’s simple math and the key to prosperity. In fact, Generating Leads is essential to creating lists of people interested in your products or services who can become potential customers and keep your business growing. Without them your business and your team are destine to fail. 92% of Network Marketers are failures! They don’t fail because the companies products, services or comp plan don’t work. They fail because they simply run out of people to talk to, while the other 8% who have cracked the code of lead generation – PROSPER! So, here is the ANSWER: You need leads! There are about as many way to create leads as there are Network Marketing Companies. If you are really ‘Working Your Business’ than chances are you have tried a few and you know that some work better than others. Taking the time to learn about the best lead generation techniques and implementing them will really boost your business and help you build a good list of interested customers who you can build relationships with and who will continue to come back to you over and over again because of it. Separating yourself from the crowd is at heart of all lead generation techniques. It will make money! http://www.FindSalesRep.com is designed to help you do rise to the top of the field and get found on the internet.